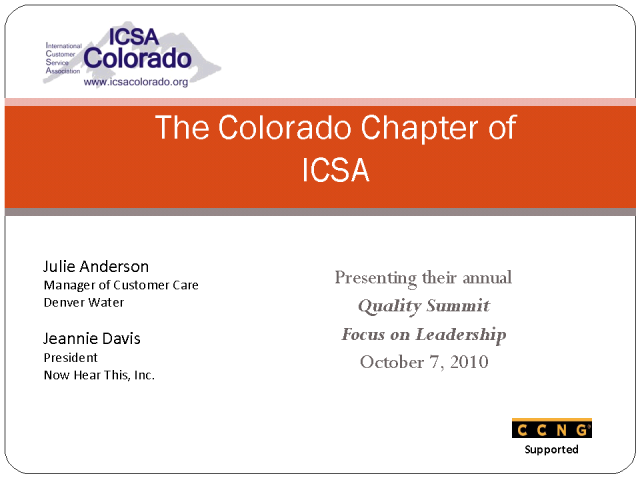 CCNG talks with representattives from the ICSA Colorado Chapter about their Annual Quality Summit...a gathering of customer service professionals to concentrate on quality tools and methods that we can apply in our daily roles. This years focus is on quality of leadership providing participants with new views of how to measure quality within their leadership ranks, how to structure a leadership assessment in their organization and other related topics. The morning session is interactive and the afternoon session will be a dynamic summary and challenge for the future. Julie Anderson, Manager of Customer Service - Denver Water, Jeannie Davis, President - Now Hear This, Inc. Presented by: Julie Anderson, Manager of Customer Service - Denver Water, Jeannie Davis, President - Now Hear This, Inc.